The EVGA GTX 470 Superclocked takes the next generation nVIDIA GeForce GPU, and cranks it up another notch by offering even higher performance! Experience heart-pounding cinematic visuals with the EVGA GTX 470 thanks to the combined power of DirectX 11, nVIDIA PhysX, and nVIDIA 3D Vision Surround technologies. The EVGA GTX 470 Superclocked contains double the CUDA cores of previous generation GPUs, a high speed GDDR5 memory interface with 1280MB onboard and full DirectX 11 support providing for unrivalled performance and breathtaking image quality. 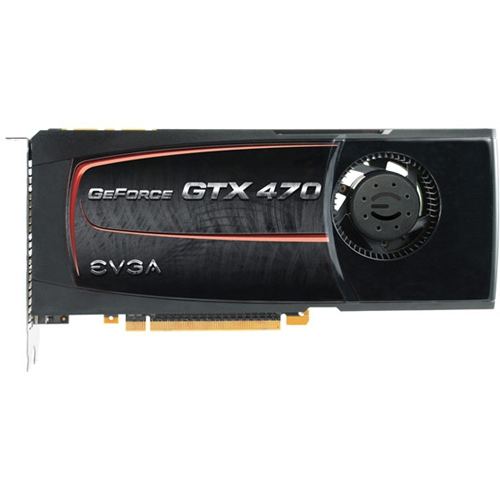 Compatible in 2-way and 3-way SLI configurations, the EVGA GTX 470 Superclocked provides brilliant and immersive experiences in games and unsurpassed computational power.